For this post I have reverted to the tried, tested, and trusted editorial facility. I have almost come to the end of my Streets of London series of colour slides produced in the first decade of this century. Today I scanned a few from May 2008. Crossing the Hammersmith & City Underground Railway line near Westbourne Park, Golborne Road W11 runs east from Portobello Road to Kensal Road. 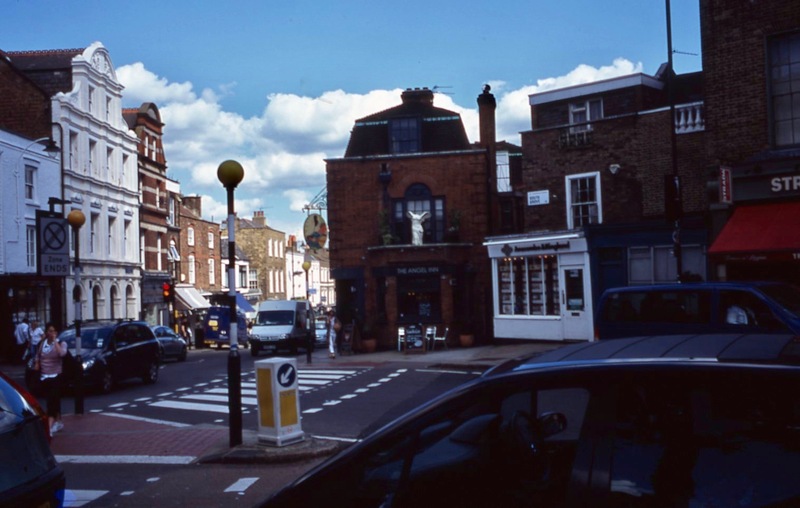 Situated at the northern end of Portobello Market It has a plethora of restaurants and antique shops. 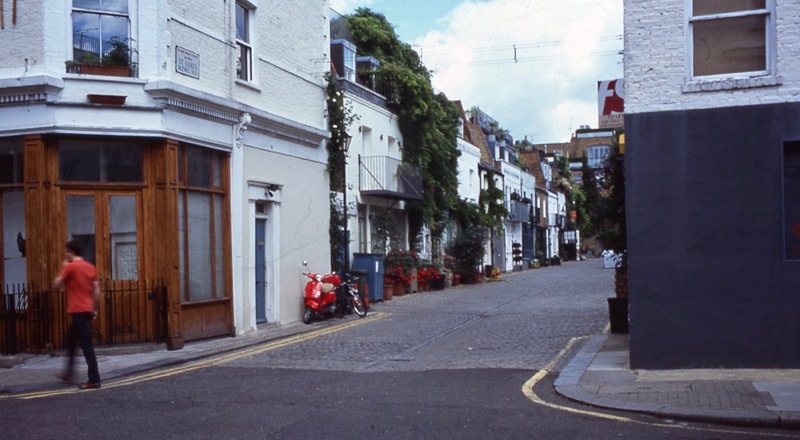 ‘This area of Notting Hill‘s northern corner has changed dramatically over its history. The area was part of the Great Forest of Middlesex; in 1543 the land was seized by Henry VIII and by the 18th century Golborne was farmland. 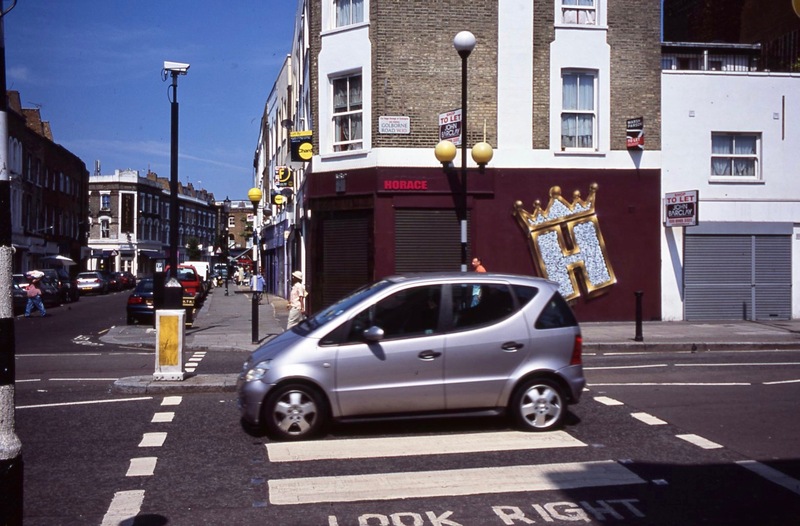 Golborne Road was named after Dean Golbourne, at one time vicar of St. John’s Church in Paddington. Until the middle of the 19th century it was no more than a country footpath crossing the fields of Portobello Farm, but in 1870 the road was widened, shops were built and the road was extended over the railway. 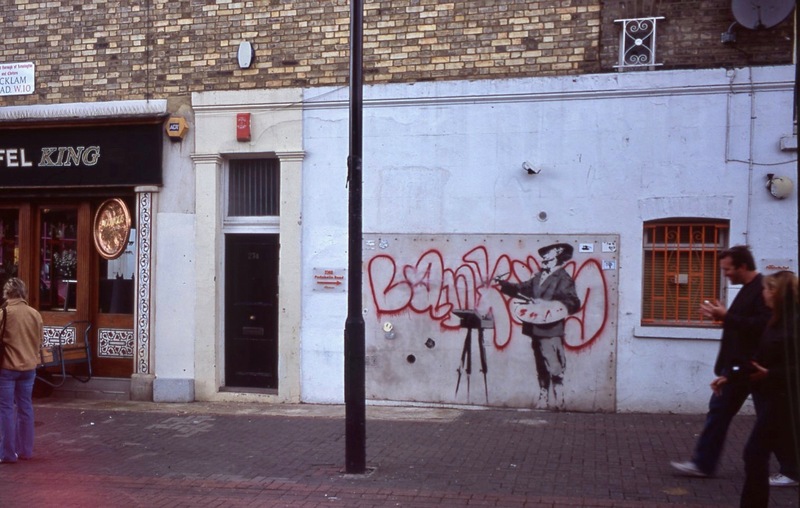 The story of the appearance of this sample of the work of Banksy on a wall in Acklam Road W10 is related in ‘Walls’. Yeah Man in Lancaster Road W11 now appears to be Jay Dee’s. The spicy Caribbean takeaway remains highly acclaimed. 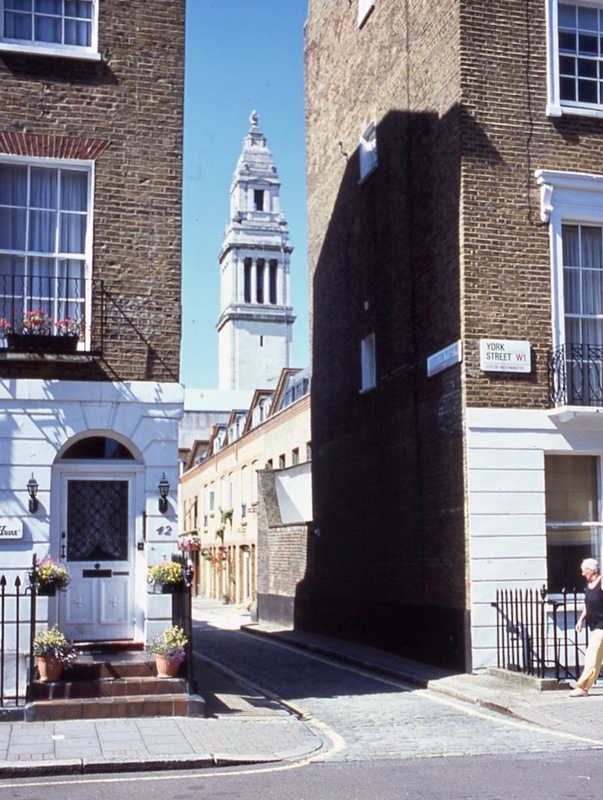 Also in this area of Notting Hill, St Luke’s Mews is where TV presenter Paula Yates lived and died of an accidental drug overdose in September 2000. I have to rely almost entirely on my memory for the next two locations because the street names are somewhat indistinct. I can say that they were all photographed at the top end of Highgate High Street during one of my trips to Highgate Cemetery to make the illustrations to ‘The Magnificent Seven’. Perhaps my next archived series could be the pictures for that book. 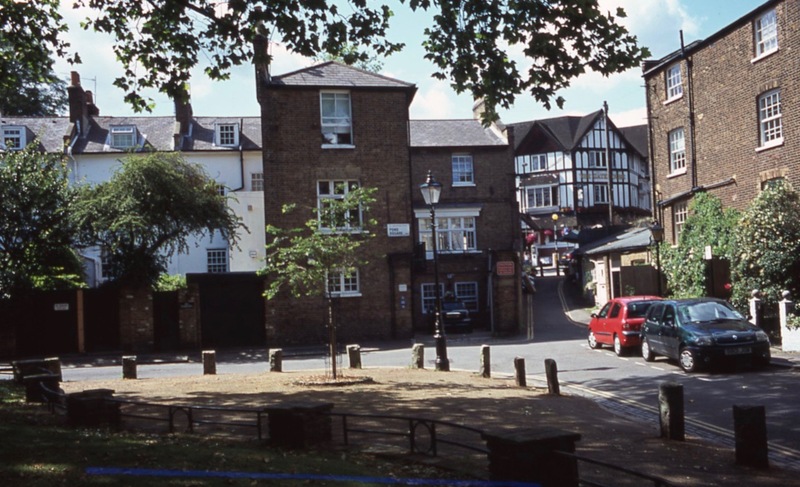 Perched above Highgate Village, one of London’s most distinguished suburbs, and just a stone’s throw from Hampstead Heath, The Angel Inn is an iconic London pub, ahead of the game in providing the perfect setting for a truly memorable drinking and dining experience. Whether it’s a relaxed lunch, sumptuous Sunday roast, indulgent dinner or lazy brunch you’re looking for, we offer an enticing range of flavoursome dishes incorporating classic British ingredients with a creative twist, all accompanied by our exceptional range of cask ales, craft beers, fine wines and artisan spirits. This elegant little square is around there somewhere. 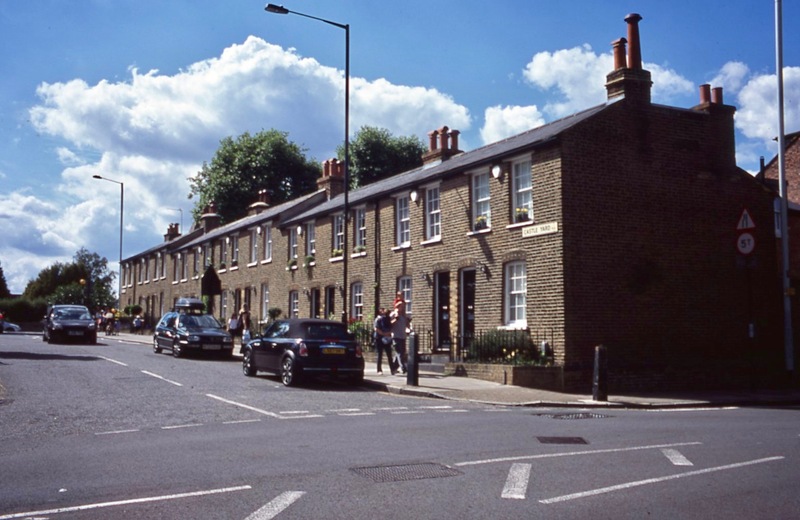 Also close to Highgate High Street, Castle Yard N6, with its intriguing little terrace, links North Road with Southwood Lane. I can neither pinpoint this section of Marylebone’s York St W1, nor identify the church tower in the background. Perhaps a reader will be able to. 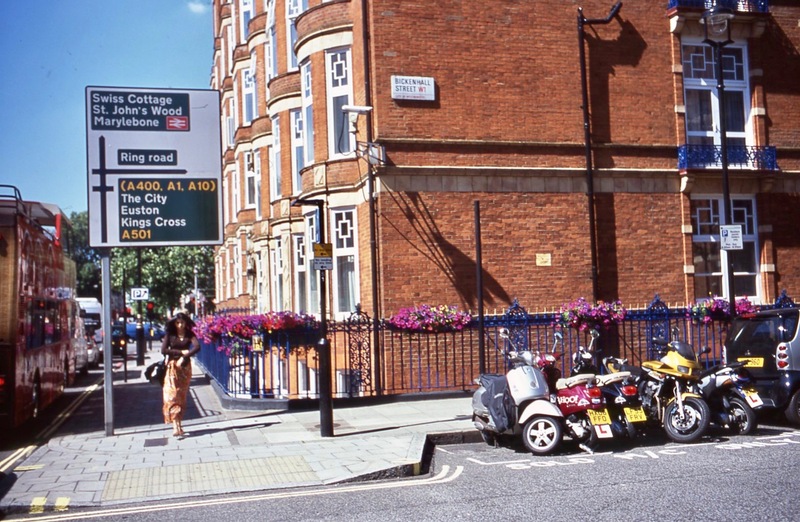 Baker Street and Gloucester Place (shown on this corner) are linked by Bickenhall Street W1. 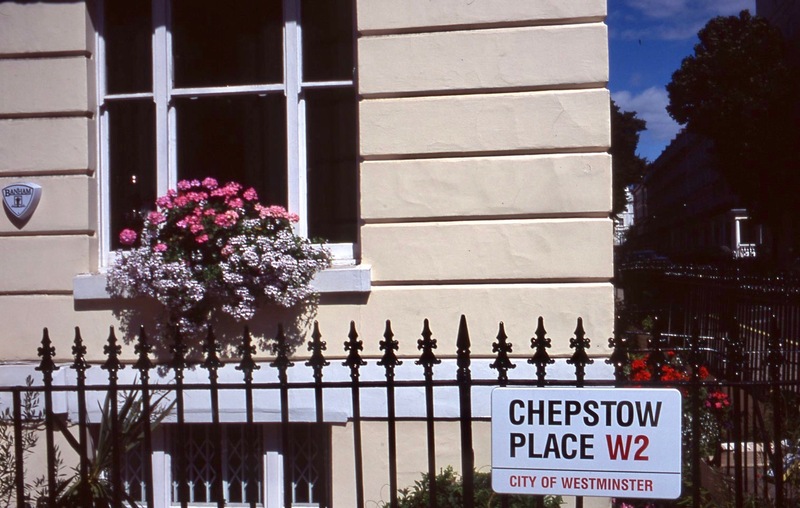 Bartholomew Malthus, a character in Robert Louis Stevenson’s story ‘The Suicide Club’ resided at 16 Chepstow Place, W2. This evening we dined on Jackie’s splendid savoury egg fried rice; spare ribs in barbecue sauce; mini spring rolls and prawn toasts with which I drank more of the Madiran. 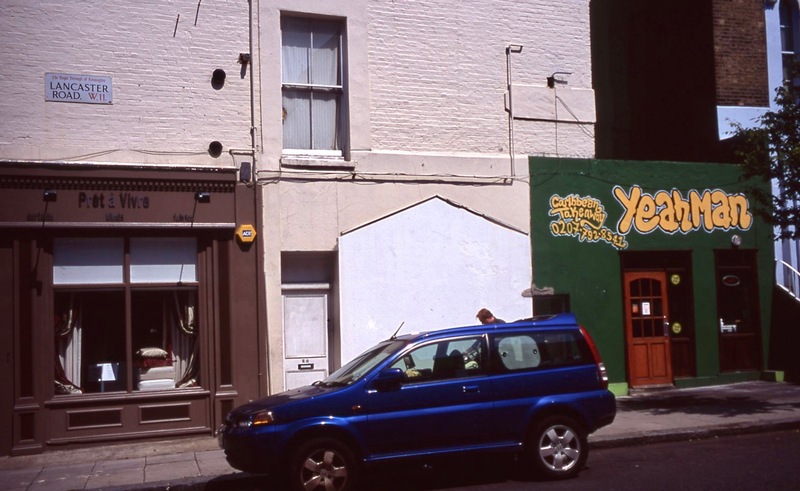 This entry was posted in Uncategorized and tagged Acklam Road, Banksy, Bickenhall Street, Castle Yard, Chepstow Place, Golborne Road, Lancaster Road, Paula Yates, Pond Square, St Luke's Mews, The Angel Inn, The Magnificent Seven, Yeah Man, York Street by derrickjknight. Bookmark the permalink. I have to say that your slides have transferred to digital really well. Interesting places. Is that angel missing her head? It’s been a while since we’ve hit the streets…perhaps it’s better for your knee. Thanks for sharing, Derrick! I never thought of making BBQ ribs with my egg fried rice. Great idea! Thanks for this bit of history Derrick. Your pictures are lovely. I am grateful for the return of neatly fitting images. Proximity of Baker Street and ‘The Suicide Club’ piqued my interest hugely. Does the lady chef make her own spring rolls? We learned to do them at a recent cooking class. I live in India, where there are many beautiful places are located, but still, I have explored none. And after seeing all these beautiful places my heart beats for them too. I want to go and have a vacation. Loved the pics. Thanks for the intriguing guided tour! In answer to your question you are looking down Thornton Place off York Street, Marylebone, between Upper Montagu St and Gloucester Place. The Tower is not a church but the Old Marylebone Town Hall! Number 42 is the Merriweather Guest House! Many thanks Lwbut. I am adding a ps to alert people to your information. Another fun London tour. Thank you, Derrick. The Angel Inn sounds like a great place–at least according to the owners. Such a lovely place. I had a wonderful chat with a gentleman in his 80s at a pub there. He told the funniest stories. I, too, was thinking of Hugh Grant, who seems to be making somewhat of comeback nowadays. Thanks for the tour. Always love a London visit! Lovely tour, Derrick. Thank you for the charming photos. Nice photos of London Derrick. London buidingsand street names remind me so much of my days of growing up in the Boston area which definiely has alot of English charm for the settlers here from your neck of the woods. Thanks for the walking tour! I loved the tour, Derrick! You had beautiful weather that day. Your London tours are always interesting – though the weather is normally unrealistically sunny for the UK. That church you need identifying ex York St, is not a church it’s; from what I can make out; the Westminster Council Hall, in Marylebone road / street, going by Google Earth. Hard to make out the proper name carved into the the part that goes across the top of the Corinthian pillars. I’ve took a snipping of the building and will send you a copy by email. Third??? Glutton for punishment are we??? Thanks Derrick my apologies for being flippant.